The people know it. With every rousing call for Sarawakian unity that Adenan puts out, the cheers only get louder. And as election talk fills the air, Sarawak rides the best wave ever sent its way since Malaysia was formed. In truth, Sarawak and its people have had this coming for a long time. As perhaps the most resource-rich state in Malaysia, one would imagine that it would by now have become an opulent monument to development and advancement. The fact that it is not rankles the heart of proud Sarawakians. If Adenan is the man who can reassert the rights and privileges that rightfully belong to Sarawak, then his time could not have come any sooner. One has only to look at his decisions to know that Adenan’s priorities are in the right place. He has clamped down on illegal logging, reduced electricity tariffs, begun abolishing tolls, and has been consistent in pressuring the Federal Government for higher oil royalties. 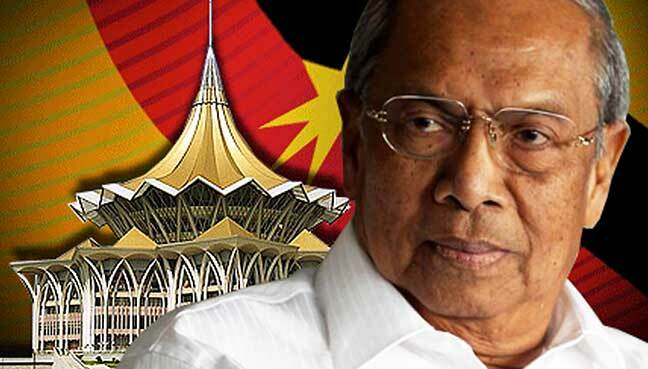 But it is his push for more autonomy in Sarawak that has become the battle cry, and rumours have it that he will get his demands should Sarawak vote BN in the coming state election. On September 16, even as KL shook with a flood of red, Najib told attendants at Malaysia Day celebrations in Sabah that the state governments of East Malaysia would soon be given more power to determine priority projects for their states, among other things. This pronouncement was the result of Adenan’s hard work in strengthening the Sarawak Barisan Nasional brand, and Najib knows that it is important that he cultivate Adenan and his policies to keep Sarawak as a BN vote bank. Change is coming for Sarawak. It is high time that it took its place as one of Malaysia’s premier states, and Adenan is determined to do just that even as the peninsula tears itself to pieces in racial strife. This is what happens when a leader has his heart in the right place, and Sarawak is poised to reap the benefits.